Gel stains are easy to apply and can be used on vertical and overhead surfaces without fear of runs, drips and sags. Results are more even on blotch prone woods because the gel consistency limits penetration into uneven grain. Pigment gel stain with Urethane Resin. Oil based, but compatible under waterbased finishes. Can be applied to bare wood. Works very well over dye stains to establish more even tones on tough to stain woods such as birch. Colors can be intermixed for custom colors. Apply by rag and wipe off. Second or third applications can develop richer tones. Also useful as a pigmented glaze for special effects on pre-sealed surfaces. 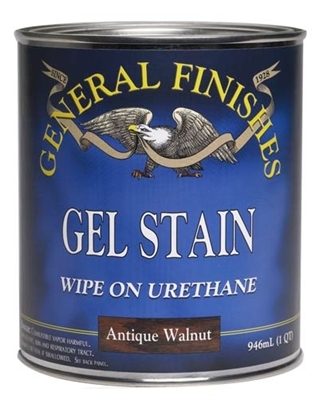 Use easy to apply wipe-on Gel Urethane Topcoat over stain for better durability and protection. For Brushing or Spray On protective topcoats in a wider selection of sheens, we recommend High Performance Poly. Colors are shown on oak veneers. Colors may not be exact on all monitors. Test stains on scrap prior to application to projects.